The legendary Fritz Kreisler and his friend Efrem Zimbalist were both ranked among the greatest violinists of their time, becoming household names in America in the 1920s. Their generation, however, regarded Eugène Ysaÿe as ‘the master of us all’. These works all transcend mere virtuoso showmanship. 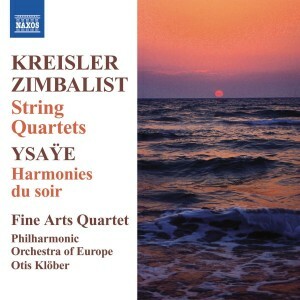 Kreisler’s Quartet is filled with emotion and unpredictable harmonic shifts, while the tender, sometimes hauntingly beautiful melodies in Zimbalist’s Quartet hark back to the composer’s Russian origins. Ysaÿe’s Harmonies du soir emerges as a sensual chromatic journey towards a glorious musical sunrise.